There’s no shortage of to-do applications and services, but whichever tool you use, it’s important to have a strategy that makes it easy to keep track of goals and accomplishments. My current to-do application is 2Do. I use it to manage my projects, ideas, and start dates for various tasks. On Sunday evenings I try to review my tasks for the week, and then use iDoneThis to motivate myself to actually get things done. 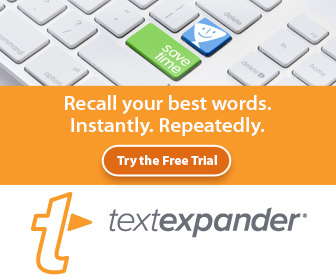 I started using the writing-based iDoneThis for a related but slightly different purpose than 2Do. Productivity research has shown that writing out tasks and goals is a useful way to process your plans, monitor your progress, and reflect on your challenges and accomplishments. The simple act of writing down and keeping track of what you accomplished is motivating and illuminating. Reviewing your tasks and patting yourself on your back for your accomplishments is a great motivator especially when you face challenges and roadblocks in larger projects. It’s also important in your to-do strategy to record the small things as well as the significant things. Thus, what makes iDoneThis different from say an application like 2Do or Omnifocus is that you’re not focusing on due dates and project outlines, but you can use iDoneThis as a productivity diary to help monitor your daily activities and long-range projects. 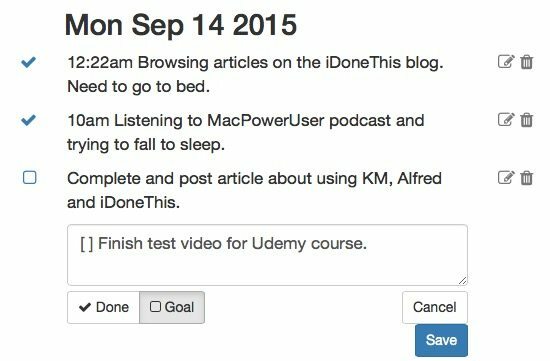 I used iDoneThis for a few months when it was first released back in 2011, but back then I was somewhat turned off by the UI, and except for using the daily email reminders to write the things I got done, I didn’t have much of a strategy for using iDoneThis. 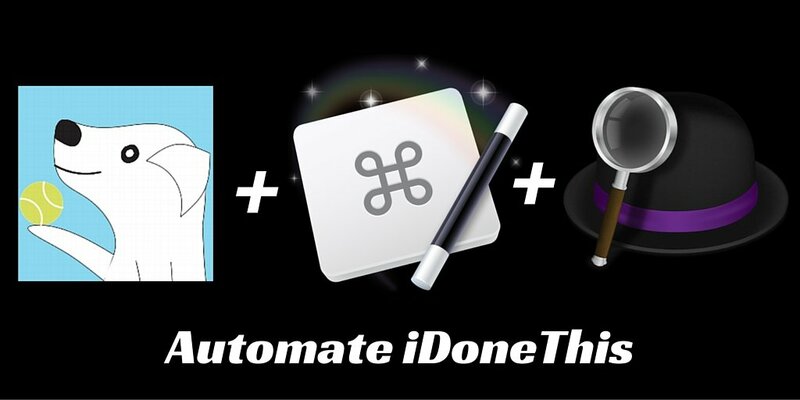 Last week I started using iDoneThis again, and this time I’m using the power of Mac automation tools to help input my goals and accomplishments. In many ways iDoneThis is simpler than using a traditional to-do application because it doesn’t push you to create folders, click buttons, and set due dates and times. But the key to using iDoneThis is writing your goals and “dones” for the day. 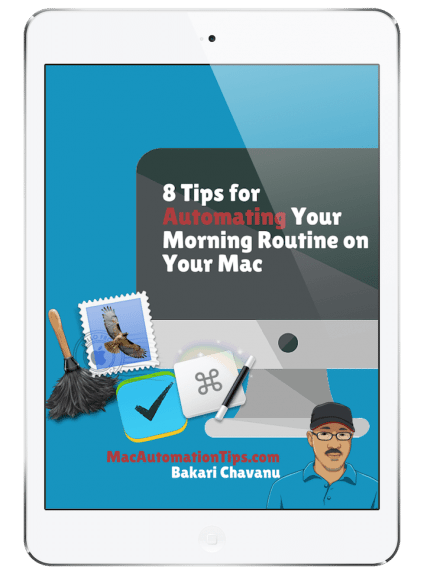 The Mac automation tools can make that process easier. The philosophy behind iDoneThis, in my view, is not to be pinned down by due dates, but to instead record your accomplishments and reflect on your processes and challenges. Setting aside time on a daily or weekly basis to reflect is a powerful productivity hack. The daily email reminders that iDoneThis sends out may be all you need to input your daily to-do’s. But in my case, I try to avoid looking at mail the first thing in the morning. And it is also helpful to keep track of my small tasks, accomplishments, and related distractions as I work throughout the day. For these purposes, I use Alfred and Keyboard Maestro. In addition, I’m starting to use SnappyApp to keep my listed iDoneThis goals visible on my desktop throughout the day. When I come to my computer in the morning, my iDoneThis calendar is the first webpage I want to see. 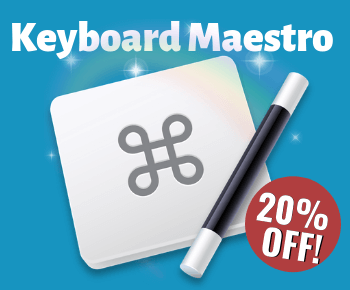 A Keyboard Maestro time trigger takes care of this task for me. I use similar time triggers to download designated webpages and applications I use throughout the week. 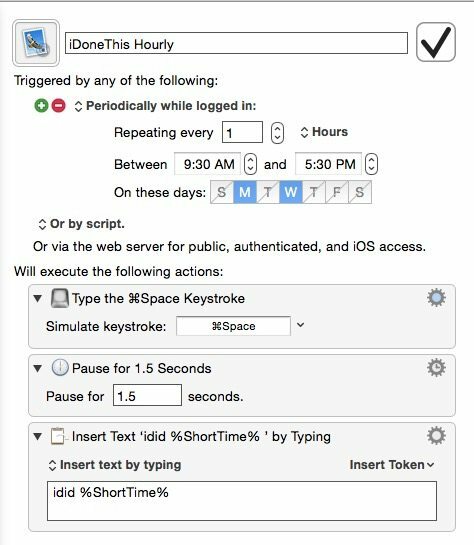 KM time triggers are nothing short of automated to-do’s that I can set up and don’t have to think about until they are ran. The purpose of using iDoneThis in the morning is to set no more than three important goals for that day. At the end of the day, I get to check off the goals I completed. Thankfully, goals not checked off in iDoneThis get moved to the next day. I’m careful not to set lots of goals for a given day because then I start feeling overwhelmed when things don’t get done. It’s better to focus a few important tasks and try to move forward with them. My biggest challenge is getting blog posts written and produced on a regular basis, while keeping up with tons of other blogging related tasks. 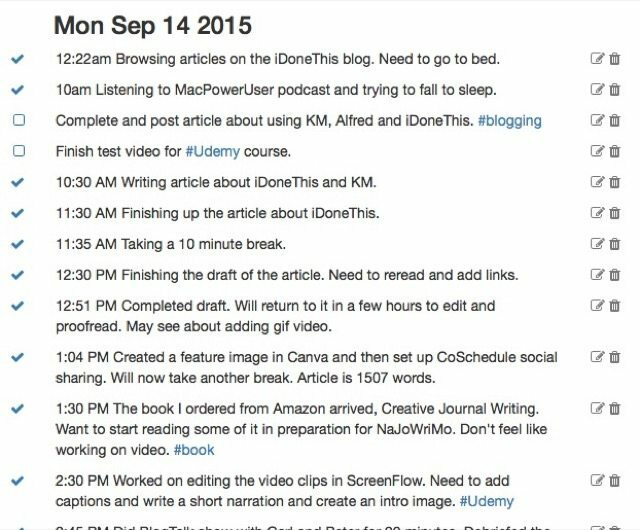 Next, I use Snappy to take a quick screenshot of my goals for today. Snappy takes screenshots and automatically opens them on your desktop so that you can review, annotate, share, and save them for various purposes. I simply park my “snap” of listed goals on my second monitor so that it remains visible throughout the day. I can then close the iDoneThis page, and I add other accomplishments throughout the day using Alfred. My KM time trigger also downloads iDoneThis again at the end of my day so I can check off my goals and input additional accomplishments. iDoneThis integrates with several applications and services. I use the Alfred workflow developed by Chad Stovern. 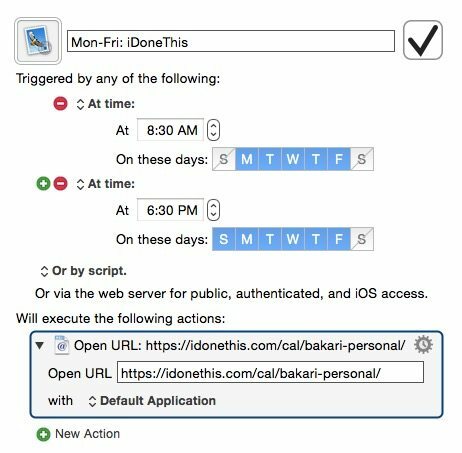 This workflow allows for inputting goals and dones into your iDoneThis calendar without opening the webpage. To use this setup, you need the pro version of Alfred, and you need to install the Alfred workflow for iDoneThis. The instructions for installing are explained on the GitHub page where you download the workflow. As a Mac automator, I’m always looking for ways to get things done with less clicking. While it’s pretty easy to manually trigger Alfred with the Command + Spacebar, followed by the hotkey, I also like to trigger the workflow using a string trigger while I type, or use a voice command. 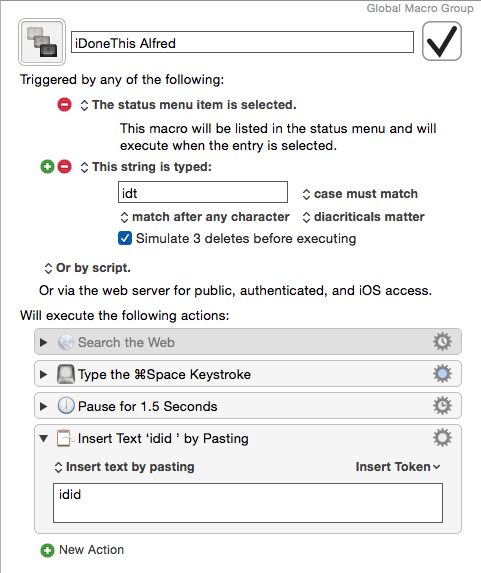 My KM macro triggers Alfred, and then it inserts the keyword for the idid script. From there, I can type my input, hit the Return key, and get back to what I was doing. I don’t have to lift my fingers off the keyboard in order to trigger the workflow. I also have the macro mapped to a Dragon Dictate voice command, which I use when my hands are not on the keyboard to run the workflow. This KM macro allows me to add dones throughout the day so I can keep track of the other important tasks, including taking breaks, answering phone calls, eating lunch, etc. One or two times a week, especially on Mondays, I like to enter what I’m doing on an hourly basis while I’m at the computer. I do this for two reasons: I want to see how long I’m taking to complete tasks, and where I might be getting distracted or wasting my time. In the past I’ve used an Alfred workflow for Evernote to keep this work log, but that workflow caused Evernote to open each time it pasted the log. With iDoneThis, it’s all done in the background. This KM macro, will run throughout the day until 5:30 PM. There are times when I’m not at the computer when the macro runs, but the Alfred window will remain open on the desktop. It doesn’t go away until I click the Return key. iDoneThis doesn’t include time stamps, so it’s great that KM can input that information for me. 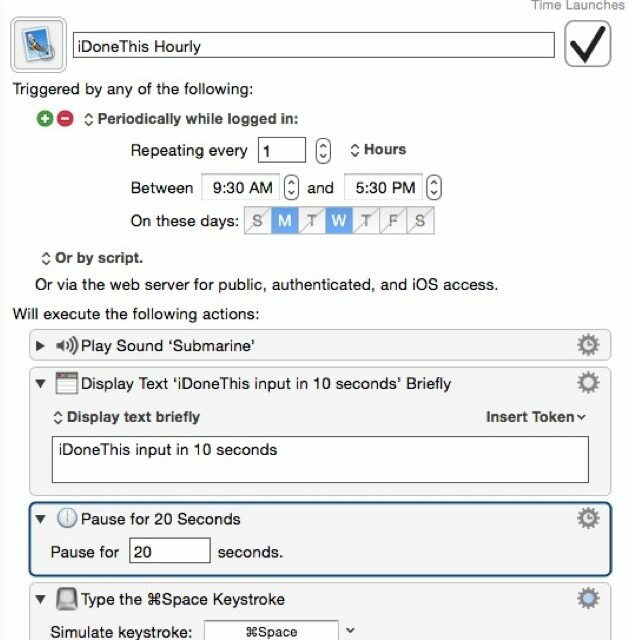 KM includes a time token that can input a time stamp in any application. At the end of the day or the next day, I review my timed inputs to review how things went for that day. I don’t use the KM time trigger for iDoneThis everyday, because it can become a little redundant and obtrusive. But I like how the automation runs without me having to think about it. Note: As I am writing this article, I realized how useful it would be to insert an alert into the hourly trigger so that I can get a warning before the macro runs. If the macro runs while I’m typing, I can stop for ten seconds and let it run. It takes less than thirty seconds to write what I’m doing into the Alfred window, and by the end of the day I have all my tasks inputted. I don’t have to spend time at the end of the day trying to remember all that I accomplished. There are days when I have least 15 items on my list. In addition, with KM running the iDoneThis time trigger again at 5:30, it serves as a reminder that I need to wrap up and get out my home office. iDoneThis also sends a daily email at the time you indicate which includes all your inputs for the day, and inputs from a week ago. I also have saved my iDoneThis calendar page as a bookmark on the home screen so that I easily access it for quick inputs. iDoneThis is a free online application, but there’s also a paid option that allows for filtering entries by tags. I’m thinking about paying for that service for two reasons: to support the company for providing such a good service, and to also filter my entries and reflect on the progress I made in completing, or in not completing projects. Done lists are an easy way to carry out constructive internal reflection. This simple method captures details, progress, and thoughts that otherwise can get lost in the stream of busy. iDoneThis has produced a short guide, The Busy Person’s Guide to Done List: the Science of Small Wins, that shares insight and research about individual and teamwork productivity. It’s well worth the read for understanding the iDoneThis approach. 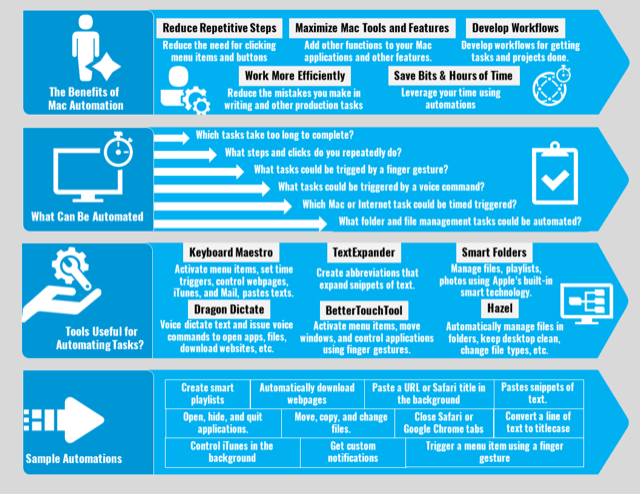 Each person’s strategy for getting things done is different, but I hope what I described above can help you see how automation tools can be useful for managing to-do’s so that you’re spending less time inside a time management application and more time actually getting things done. After a few more months of using iDoneThis, I will report back what I learn about this system, and what changes I made to the strategy. I welcome your feedback on this strategy and how it might be useful to you.